As you may or may not know, I enjoy the hourly occasional slice of bacon. 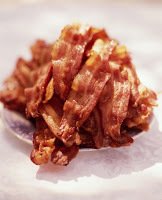 Here are a couple neat links on the subject of bacon. Quiz: Are you addicted to bacon? Infographic: How to use bacon to make your life incredible and amazing.